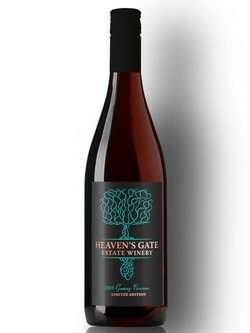 Since our first year of wine production in 2010, Heaven’s Gate Estate Winery has been producing delicious and unique vintages year after year. At our vineyard, we pay special attention to the detail because we know that to make exceptional wines you must first grow exceptional grapes. Our wines can be paired with a wide array of dishes–from our crisp Sauvignon Blanc/Semillon blend with a delicious healthy salad, or savouring our bold Merlot with a mouth-watering steak, to pouring our floral Gewürztraminer with a decadent dessert—the possibilities are endless. Our selection of handcrafted table wines currently available include: Merlot, Malbec, Gamay Noir, Rose, Pinot Gris, Gewürztraminer, Sauvignon Blanc, a Sauvignon Blanc/Semillon blend, and our Merlot/Malbec blend. This limited edition Gamay Nouveau was whole cluster fermented with natural yeast in a carbon rich environment for two weeks. The natural yeast leads to bright and fruit forward notes of fresh strawberry and a delicate banana finish. With less than 30 cases produced, every bottle is individually numbered. Our 2017 is no ordinary Gewürztraminer. It has full bouquet of Lychee and just a hint of fresh rose pedals that sets the stage for the crisp and clean flavours that follow. 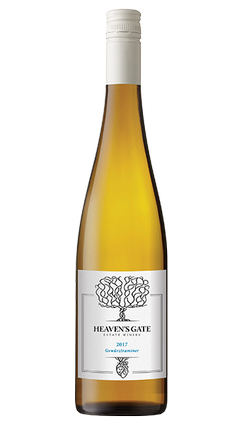 This may be our smoothest and most refreshing Gewürztraminer yet. Pairs best with strong cheeses and spicy dishes. Big changes for the Rosé this year. The 2017 is a handcrafted blend of 91% Gamay Noir, 6% Merlot and 3% Malbec. 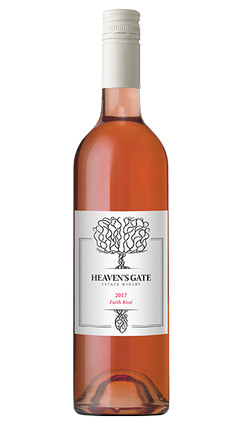 Expressing a delicate and earthy nose, the palette has a slightly caramalized peach start, leading to candied strawberry and finishes with rubarb and a hint of blackberry. We are extremely proud of how this restaurant designed wine turned out this year. 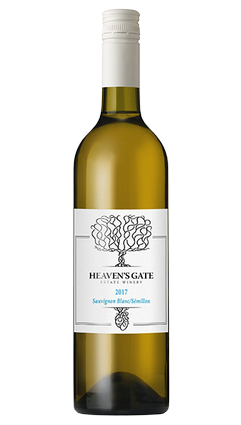 Fresh green apple jumps out of the glass, luring you in to a very refreshing high acidity, low residual sugar wine that offers flavours of golden apple and sweet pear with a surprisingly crisp finish. This soft and silky smooth Pinot Gris is very fragrant with floral and tropical notes on the nose and showcases flavours of intense pear, delicate peach and a touch of citrus on the finish. 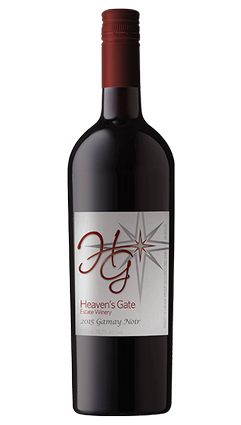 Brand new to the Heaven’s Gate lineup this year, our intensely deep purple Foch is a very full bodied wine with complex layers of caramel, black cherry, blueberry and figs with a light vanilla finish. This vintage is very bold with perfumey scents of toasted oak and spicy clove lead to lush flavours of black cherry, soft blackberry and a sweet vanilla finish. 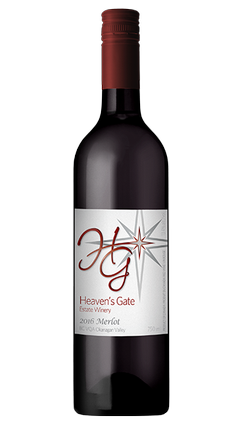 Offering a sweet vanilla bouquet and bold flavours of ripe blackberry and juicy dark cherry with a hint of white pepper and a long finish. Showcasing flavours of blackberry, black cherry and juicy plum with a perfumey toasted almond aroma and a velvety, floral vanilla finish. On the nose this vintage has a unique scent of sweet caramel. 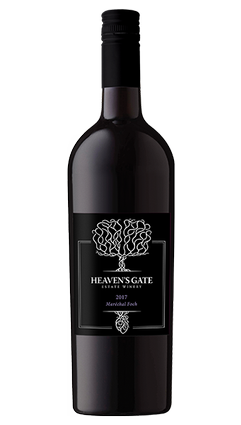 Savour the velvety layers of lush blackberry and rich dark cherry with a silky-smooth finish. This is a one of a kind vintage that has been wowing crowds of people at wine festivals this past year. This combination creates a balance of beauty and strength. The boldness of our Merlot together with the fruit forward smoothness of our Malbec delivers a lively burst of toasted caramel with a soft vanilla finish. Scents of toasted oak and spicy clove lead to lush flavours of black cherry, soft blackberry and a sweet vanilla finish.